In the future, our discs will be made out of rocks or something like that, and some people say that is a good thing LOL. Too bad for all the people that bought CDs, DVDs and Blu-Ray Discs, like me… You are of course going to need a new burner strong enough to etch your data as well. ;) Read more below. More and more folks are turning to cloud services like Dropbox to store their oh-so-precious private data, but when it comes to truly valuable info, it’s still a good idea to keep a physical backup disc around in case those virtual services crap out on you. Then again, CDs and DVDs scratchwaaaaay too easily and have limited shelf lives. 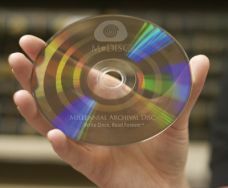 If you’ve ever been screwed by a big gouge across an important backup disc, you might want to check out the new optical media that’s hitting the market soon. Supposedly, it lasts forever, and the Department of Defense vouches for its resiliency. They’re called M-Discs and they’re being brought to market a start-up company called Millenniata, Computerworld reports. M-Discs ditch the traditional reflective layer found in standard physical media discs and instead etch the information directly into the body of the multi-layered disc itself, which is made of an undisclosed stone-like substance. Millenniata says that any device that can read a DVD can read an M-Disc – the only special equipment necessary in the whole process is an M-Disc burner. That’s cool in and of itself, but Millenniata also claims that M-Discs are darned near impervious to damage. They told Computerworld you can toss an M-Disc in liquid nitrogen, then dump boiling water all over it, and nary a byte of data will be damaged. A DoD study found no data loss after subjecting the M-Disc to grueling conditions — a claim no other disc can make. Although LG’s supplying the initial round of M-Disc burners, Millenniata’s CEO says that any DVD hardware manufacturer can make the jump to M-Disc by installing a firmware upgrade on their machines. The M-Disc’s staying power comes at the cost of burn speed, however; you can only write to them at a 4x rate. At that speed, it’s almost a good thing that M-Discs will only be able to match standard DVD capacities of 4.7GB when they hit the shelves in October for $3 a pop. Millenniata puts their money where their mouth is by offering a lifetime warranty for the discs.